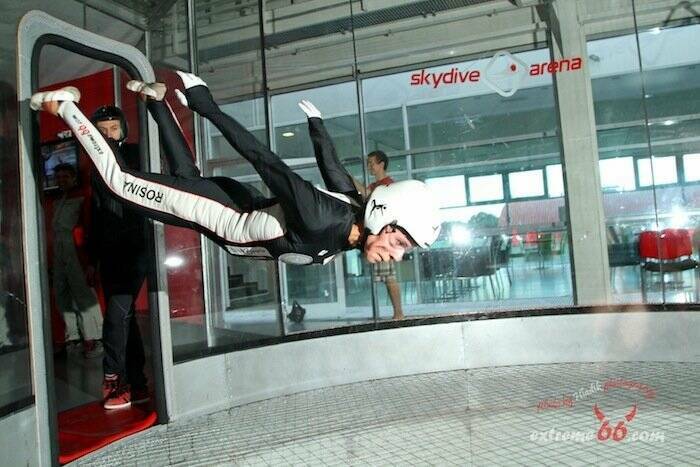 Would you like to try the amazing feeling of free fall in the safety of wind tunnel with professional experienced coaches? Then you're in the right place. Experience what it feels like to fly in the only circular glass flight chamber in the world! After a short briefing and without any special training you can try a flight under the supervision of a professional instructor. Our vertical wind tunnel is modified for beginning flyers, stable stream of air at a speed of around 200 km/h corresponds to a real free fall! Children younger than 5 years of age, Pregnant women, Persons under the influence of alcohol or other drugs, Persons with impaired blood circulation, Persons with back problems, spine or any injuries, Persons weighing over 130 kg. Each flyer signs a declaration about his/her health status and persons under 18 years need the consent of a parent or guardian. Please arrive at the windtunnel at least 60 minutes prior to your flight. You can bring along friends or family who can watch your flight, take pictures or shoot. We recommend comfortable clothing under the suit and sports shoes. The tunnel is equipped with a recording system which allows to obtain a record of your flight as a memory of this unique experience. WHAT DO YOU NEED TO DO TO FLY WITH US? Go to our ESHOP, choose one of our packages and schedule your flight! Program for those who have no experience with Indoor Skydiving and would like to try it. Complete training and coaching by professional skydiving coach + safety instructor, loan of equipment and experience two 1.5 minutes inputs (3 minutes of free fall roughly correspond to three jumps from a plane). The price incudes DVD with video from your flight as a nice memory and video debriefing from each flight! 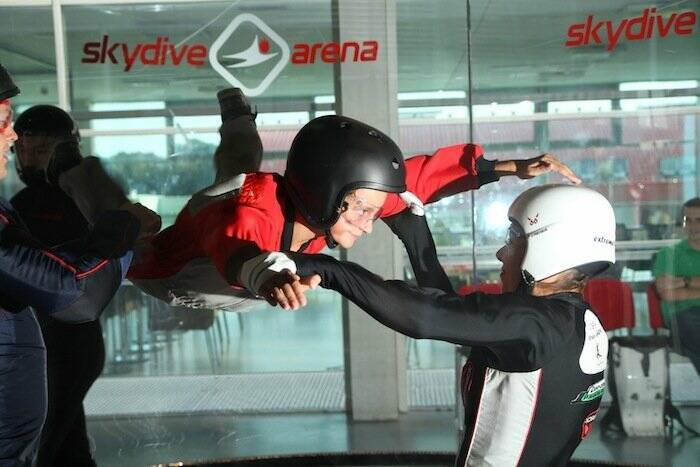 Program for those who have no experience with Indoor Skydiving and would like to try it. Complete training and coaching by professional skydiving coach + safety instructor, loan of equipment and experience 4x 1.5 minutes inputs (1 minute of free fall roughly corresponds to one jump out of a plane). The price incudes DVD with video from your flight as a nice memory and video debriefing from each flight! The optimal choice for beginners who would perhaps like to dedicate this sport a little more. Following the professional training you will undergo 6 entries (each 1.5 min), during which you are led by professional skydiving instructor through the basic skills of body coordination in terms of free fall and safety instructor. It will teach you to coordinate the movements so you are not only able to remain stable without the aid of an instructor in the air, but managed to fly to the specified position, coordinately change the height of your flight, turn and do other basics maneuvers of freefall. The price incudes DVD with video from your flight as a nice memory and video debriefing from each flight! Fly 3 x 10 minutes with coach in FUN mode and become a sports tunnel flyer. This package is suitable especially for future skydivers, you learn to control the movement in the tunnel and get the necessary stability. We will rent you the suit, helmet and skydiving goggles. The product is booked in three sessions each lasting 10 minutes, we recommend to spread training to more days, or let the one hour break between workouts. The price incudes DVD with video from your flight as a nice memory and video debriefing from each flight! As soon as you experience the first 30minutes of indoor skydiving at our or any other windtunnel, you can join the SPORT FLIGHT sessions!